Today we start an amazing trekking in one of the deepest canyons in the world: the Colca Canyon, located about 160 km northwest of Arequipa, Perù. "Colca" comes from the name of a mountain where the food was once kept as a fresh place and hence used as a natural refrigerator. To reach it, it is strongly recommended to buy a tour at a local travel agency. There are different tours depending on how much you want to spend. Following the advice of other travellers, we decide to buy a 3-days and 2-nights tour for about 40 euros each. We leave from Arequipa at 3.20 am by minibus to reach the village of Chivai at about 6 am. After being divided into groups and giving us a guide (we are really impressed by our qualified Peruvian guide named Norma), we start the first path, which lasts about 4 hours. Although it is downhill, it is quite hard due to the heat and the altitude sickness (for those who suffer from it). We are over 3000 m high. Luckily we have really nice travel mates. The group is made up of a nice French couple, a Canadian girl really into hiking and a Czech Republic guy who explains to us the crucial relationship between food, body and soul. We spend the first night in the tiny village of San Juan, where local women prepare a typical Andean lunch made of soup, rice and sheep meat (oveja). After a nice cold shower and a rest, we have dinner all together before the sunset. Then we drink hot mate (typical South American tea) under a starry sky because of the lack of electricity in this area. The next morning, the alarm rings early and after a quick breakfast, we start the second hiking. The trail alternates slopes and steep climbs, crossing small shops with some water, fruit and snacks on the way, really useful for regaining energy and fighting the heat. In some villages like Malata, you can still meet people who speaks Quechua. Kids, in these communities, are forced to walk for hours and hours to reach the closest school. Really admirable! The aim of the second day is to reach an enchanting oasis in the middle of the canyon where we have delicious local soup for dinner. In the late evening, with no artificial light, we stop again to admire a starry sky almost unreal. It is the perfect background to make a fire altogether, sharing stories and experiences. Absolutely magic. At 9 pm we go to bed because the alarm will ring at 4.30 am. The guide decides to start the trekking before dawn to avoid the hottest period of the day since it is a rough climb of 3 hours. We need to use a flashlight and bring a lot of water. At the end of the trail, we walk to a nearby restaurant for a big breakfast (we can’t wait for it!) followed by a relaxing stop at the local spa on the way back to Arequipa that we reach at 5 pm. The whole trekking, especially the final day, has been a personal achievement for all of us of the group. It has been a tough but interesting experience, with fascinating landscapes and realities out of this world. The most touching part has been the daily and real relationship with local people, always very kind and friendly. It was a mix of different lives, traditions and cultures that enriched us a lot. 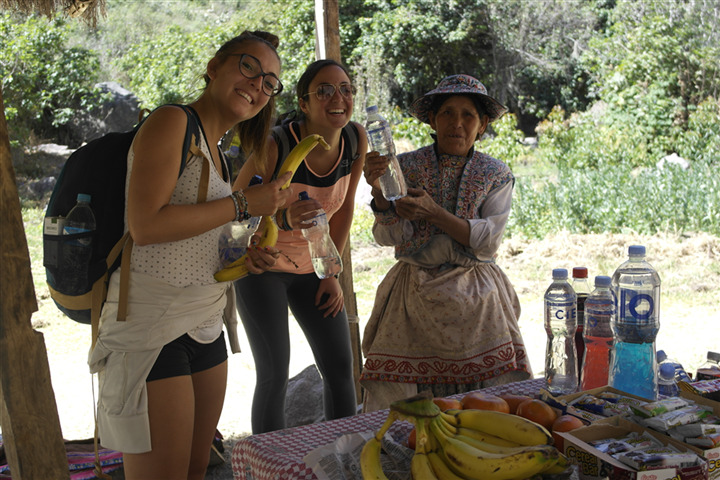 An unforgettable experience not only of trekking but especially of responsible tourism in which, thanks especially to the ability of the guide, we could fully immerse ourselves into the daily life of local communities. Useful tips for those who decide to undertake this tour: light backpack, few sports clothes, a sweater useful after the sunset, flashlight, sunscreen, energy snacks and at least 2 litres of water.